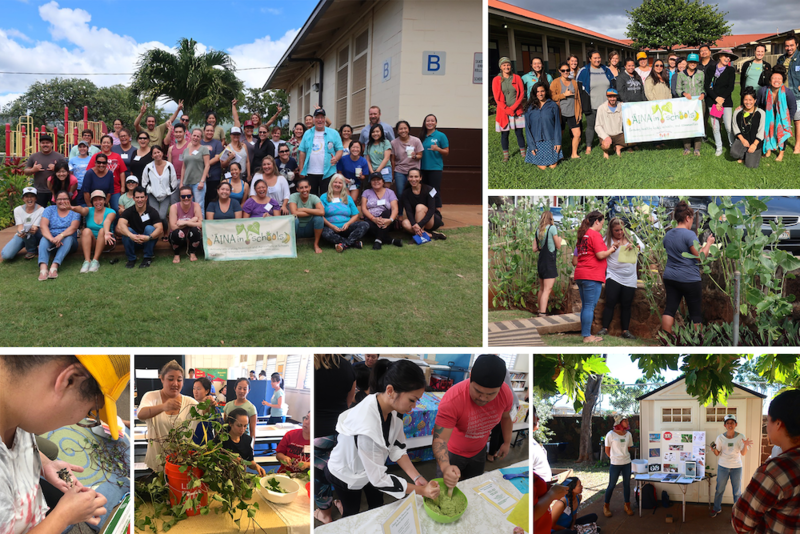 January was full of ʻĀINA In Schools Curriculum Trainings for Educators! We partnered with Windward District CTE, Kamehameha Schools ʻEwa Region, Mālama Learning Center, Oʻahu Invasive Species Committee, Maui School Garden Network, and Grow Some Good to train over 75 Oʻahu and Maui educators representing 35 schools and organizations in the ʻĀINA In Schools Curriculum and school garden basics. Highlights for teachers included a session from Mālama Learning Center and on how to manage a sustainable school garden while mitigating the spread of invasive species like the Coconut Rhinoceros Beetle and Little Fire Ant; lessons from the Grade 3 composting curriculum where we made and used bokashi, a Japanese style of anaerobic composting utilizing beneficial microorganisms to ferment food scraps; and hands-on cooking stations with ‘ĀINA Garden and Nutrition lesson recipes using fresh, local produce harvested from the school gardens. Together we made palula (sauteed ‘uala leaves), kōʻelepālau, Body-Building Black Bean and Corn Salsa, and more. Mahalo to all our partners and educators that made this year’s ʻĀINA In Schools Curriculum Trainings for Educators a success!